CalculiX is a package designed to solve field problems. The method used is the finite element method. With CalculiX Finite Element Models can be build, calculated and post-processed. The pre- and post-processor is an interactive 3D-tool using the openGL API. The solver is able to do linear and non-linear calculations. Static, dynamic and thermal solutions are available. Both programs can be used independently. Because the solver makes use of the abaqus input format it is possible to use commercial pre-processors as well. In turn the pre-processor is able to write mesh related data for nastran, abaqus, ansys, code-aster and for the free-cfd codes dolfyn, duns, ISAAC and OpenFOAM. A simple step reader is included. In addition external CAD interfaces like vda_to_fbd are available. The program is designed to run on Unix platforms like Linux and Irix computers but also on MS-Windows. The CalculiX package was developed by a team of enthusiasts in their raw spare time. They are employees of MTU Aero Engines in Munich, Germany which granted the publication. Contact information can be found at the bottom of the "Download" page. For a quick overview of the capabilities of CalculiX the results of an investigation of a small jet engine are presented. The jet engine was build around a turbo-charger rotor in the early 90's by Andreas Funke and Klaus Wittig. The FE-model was build from scratch with CalculiX and the compressor- and turbine models together with solver input files can be found in the distribution. The calculations were done to determine the burst-speed and the highest allowable rotational speed concerning low cycle fatigue and creep. In addition the eigenfrequencies were calculated to determine possible resonances with the vanes. The models are meshed with 20 noded brick elements with reduced integration. The right and left side of the disks are connected by cyclic symmetry equations which allow to calculate eigenvalues and mode-shapes for certain nodal diameters of a rotational symmetric volume based only on a segment of the structure. The compressor is made of casted aluminum alloy (AlSi - C355) and the turbine of a high temperature alloy (Inco 713C). 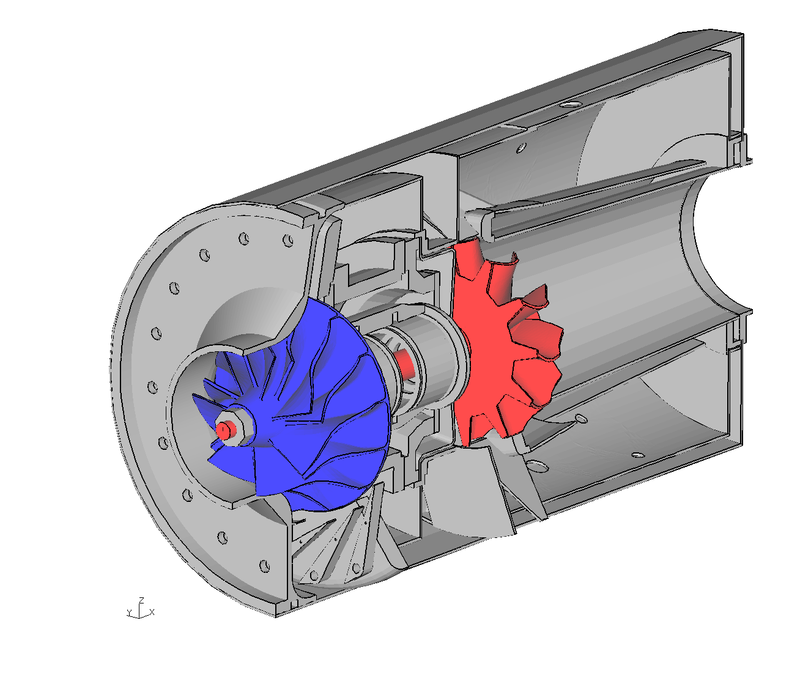 CalculiX FE-Model of a jet engine with turbo-charger compressor (blue) and turbine (red).